Trekking in Nepal, treks in Nepal literally means walking in Nepal along the rural, isolated areas and often rugged terrain giving trekkers close-up views of incredible soaring mountains, natural scenery, river basins, deep forests, wildlife etc. Nepal has eight of the top ten highest mountains in the world and some of the most beautiful landscapes which are only accessible on foot mean by walks. Trekking in Nepal is a big part of the ultimate Himalayan adventure and a majority of tourists have trekking as a part of their holiday itinerary to get a truly amazing experience. The huge variety of options allows for people of all ages and capabilities to attempt treks in Nepal Himalayas. Nepal has some of the best trekking and hiking trails in the world that offers the stunning scenery of the beautiful mountains and a chance to meet its cheerful friendly people who always welcome you with their smiling face. Nepal treks are offers ultimate opportunity for intrepid explorers who are forever in quest for adventures in the Himalayas, with captivating landscape of Nepal Himalaya range and unrivaled diversity of flora and fauna. Many visitors come in Nepal for just make a trekking to Everest, Annapurna, Langtang, Helambu, Mustang, Manaslu, Dhaulagiri, Makalu, Kanchenjunga, Rara Lake, Rolwaling, Dolpo and other virgin treks routes that are provides lots of fun in new taste. 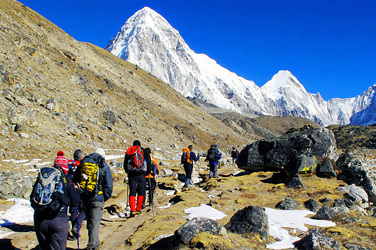 Nepal trekking holidays is indeed, an inspirational treat to the trekkers. From the warm and lush vegetation of the lower hills to the ice slopes of the highest mountain range on earth, one will experience a truly delightful bond with the nature instilling in you an amazing spirit of adventure. And you will encounter some of the most stunning scenery and the friendliest people imaginable. Nothing can be more fulfilling experience than trek in Nepal Himalaya that will let you camp in the jungles, surrender to the wilderness, bond with the nature, eat and sleep under an open sky, sing and dance around campfire and directly interact with local people. It is truly the perfect way to escape the hustle and bustle of everyday life and to relax and enjoy nature at its very best. Nepal’s is suitable country for lowland trekking to higher passes treks, easy day hiking to long changeling trekking for adventures lovers. Treks in Himalayas are the best way to explore the undeveloped country to learn about the culture, enjoy with nature and wilderness. We do have special packages for trekking in Nepal Himalayas. Check in below links to find the best treks of Nepal.